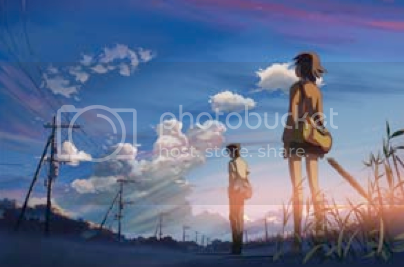 Last weekend, I had the privilege of attending the east coast premier of Makoto Shinkai’s latest film, 5 Centimeters Per Second, at the New York International Children’s Film Festival. This title was originally going to be screened at the New York Anime Fest last December, but ADV pulled it out at the last minute in order to give NYICFF the honor of making it a premier at their fest. I must say, the best things about attending the screening was getting introduced to the NYICFF. This festival promotes a huge number of independent, experimental, and, in the case of anime, foreign films that all target a younger demographic. I’m not quite sure how the kids handle these odd films, but as a mature movie buff, I found myself very interested in many of the films screening in NYC over the next few weekends. Before the screening, they ran a slide show of all the past films that have premiered at the festival, and as it turns out, they have great taste in their selections. They were the first to bring over many of the Studio Ghibli films to the US, such as My Neighbor Totoro, Castle in the Sky, Nausicaa, and The Cat Returns. The film they premiered last year was the wonderful The Girl Who Leapt Through Time, which makes me wonder just what the hell I was doing last year that made me miss that one! This year had two other Asian anime films premiering with 5 Centimeters that I really wanted to see, but couldn’t work it into my schedule. Summer Days with Coo is a 2007 film about a boy who finds a kappa, a mythical Japanese creature, and set out to find a new home for him. 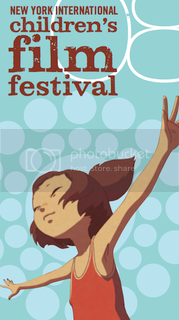 But what looked really appealing was the Korean anime film, Yobi the Five Tailed Fox, which is featured on the festival’s posters, brochure, and program cover. The film looks like a Miyazaki-inspired fantasy, filled with cute animals and images. I have never seen a Korean anime before, so I’m sure it would be interesting to compare it to its Japanese counterparts. Now on to the film I actually was able to see. Makoto Shinkai won me over with his 25-minute masterpiece of an OVA called Voices of a Distant Star. That short told the story of two young lovers thrust into the ultimate long distance relationship – outer space. The girl is forced to go on a mission that will take her far away into the galaxy, leaving her boyfriend behind on Earth. They maintain correspondence with each other by sending cell phone text messages through space. But as they travel further apart from each other, their messages take longer to travel, providing a perfect symbol of the loneliness felt when being separated from your love for so long. Although it’s a completely fictional sci-fi story, Shinkai made it feel more realistic than any “Slice-of-Life” anime ever does, and manages to bring back many personal memories for me as well. 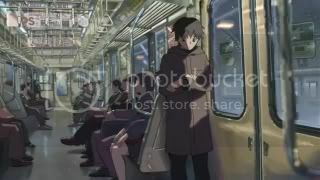 5 Centimeters Per Second continues on this theme but without the sci-fi backdrop. The film shows the love life of Tono Takari and his relationship to his childhood sweetheart, Shinohara Akari. The two are separated towards the end of elementary school. In act one, middle schooler Tono takes a long trip to visit Akari one last time before he is forced to move even further away from her and, in theory, will never see each other again. Act two shows Tono just about to graduate high school. A new girl has developed a crush on him and works up the courage to confess her love. And act three shows Tono in his mid-20′s. He’s a working professional and has just come off of a long-term relationship. Even ten years after act one, he’s still thinking about girl he loved as a child. First of all, I’m glad that I was able to catch this in a movie theater rather than on DVD or screened on some cheap projector. We only get about 2 anime films with theatrical runs every year in America, and most of them are played on very limited screens. So this kind of showing is a rare event, but they picked a good one to show. There are many beautiful landscape shots that look incredible on the big screen. Most of act 2 was simply jaw dropping, like in the scene pictured below. But despite the visual beauty, the structure of the film is very unusual. Each act ends with a simple “The End” and credits begin to role. There is a brief black screen before the next act begins. This left the audience very confused. Everyone started clapping after act one and began to leave their seats, only to rush back once the 2nd act started. When act two ended, the house lights in the theater came one, only to quickly dim again once the third act started. This was very awkward, and the audience should have been told about the film’s unique structure during the introduction by the festival’s hosts. Another problem with the film at the children’s film festival is that this wasn’t a film for children! While the program clearly stated that this film was intended for teenagers and above, most of the audience were families that included very small children. They probably had passes to attend every film at the festival, so this was just one of many films they were seeing for the next couple of weekends. But the kids in attendance were not able to sit still for 5 Centimeter, which was understandable. The film’s slow pacing left even this 23-year-old boy fidgeting in his seat. I didn’t have a cell phone when I was in middle school! And so starts the Shinkai brilliance. I realized by the 2nd act that Tono and I are around the same age and growing up in the same time frame. In the first act during middle school, Toro has to make the long journey without the help of the cell phone, which weren’t at all popular in the mid-90′s. In the second act, he plays around with simple text messages, much like I did when I got my first cell phone junior year of high school. And in the third act, Toro is constantly checking his cell phone while he’s at work in front of a computer, just like I do every day right now. This familiarity with the character made it all too real when watching the modern day Tono in the third act. Over a decade since adolescences, he was now a young working professional. He had experience in serious relationships before, but was still unsettled and currently single. And most of all, he was anticipated that the perfect love would be coming into his life any minute now. It was all way too real to me… painfully real. And than comes the knock out punch, a three-minute montage of Tono’s first decade of love. While a lot of the clips were already shown in the movie, most of the montage showcased all the events and images that you never saw in the film, all the stuff in between the three acts. Again, all the things that everyone experiences at that age. Even the song being played is a very popular song from 1996, a move Shinkai made to bring the audience back to ten years ago. This montage made the movie worthwhile. While I really could have done without all the static images and boring moments of the film, I cannot deny that it had some sicking power over me at the end. I left the theater in some kind of state of shock, and I spent a long time sitting in the NYC subway trying my best to collect my memories and emotions together again. Your mileage may very when watching a Shinkai film, but for me, he’s able to expose real human emotion and memories through his fictional characters and beautiful visuals. This entry was posted on Wednesday, March 5th, 2008 at 7:20 pm by Scott	.